How Long do Ambrosia Apples Keep? It’s around this time of year that Ambrosia apple fans start to worry about when the supply will run out. Ambrosia apples are typically harvested in late September here in North America meaning we’re nearing the six month marker. So, how much longer can the Ambrosia apple supply last? Don’t panic! Within hours of being picked, Ambrosia apples are taken to the packinghouse and prepped for storage inside a controlled atmosphere facility. This isn’t just a refrigerated room. Inside this storage facility, the oxygen, carbon dioxide and nitrogen, as well as the temperature and humidity are all set to optimal levels to ensure maximum longevity and freshness for the fruit. In these conditions, apples can stay fresh for up to a year. 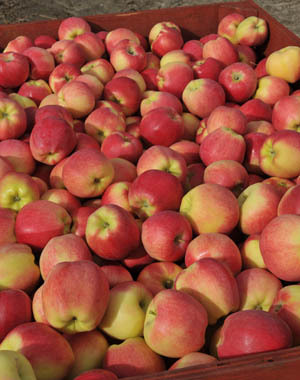 Keeping your Ambrosia apples fresh once they make their way to your home is up to you. Since you can’t turn your basement into a controlled atmosphere storage room, here are three tips for keeping your Ambrosia apples crisp and juicy. 1 – Wrap it Up. You’ve heard the saying, ‘one bad apple spoils the bunch’. It’s true. If one apple starts to rot, any apple that is touching it will also start to go and before you know it, they’re all gone. Take a note from grandma’s book and wrap each apple in brown paper or newspaper to keep them separate. Paper is better than plastic because the apples can still breathe. 2 – Keep Cold. Store your apples in a cold place like a basement or a refrigerator. Be careful not to store them in an uninsulated shed or garage if you live in a place where temperatures drop below zero. You want cold, not frozen apples. 3 – Eat Them Up. The best way to keep your Ambrosia apples fresh is to eat them quickly. Buying them more frequently ensures that you’re getting the freshest apples. Apples are removed from controlled atmosphere storage as stores demand them so there’s a good chance that the ones you buy this week were in special storage until just recently. If you follow these simple steps, you should have fresh Ambrosia apples for a few more months. That is, until supplies run out. When that happens, the countdown to September begins!